Ugh... what happened to my brown headband I like? The toothpaste is in here somewhere, right?? I first had to decide what really needed to be in that bathroom drawer. Did I really need to have the razor blades in there that I change out every 3 weeks or so? No. Was it necessary to have that sparkly lotion that I probably hadn't worn in months in there? Not really. Anything that was not something I used everyday in my beauty routine went on a shelf in the closet in the hallway. Okay, so this may be one of my favorite things that I did. A stick-on magnetic strip adhered to the inside of my drawer to store all my bobby pins on! How clever is that?? I cannot tell you how many times I have spent 5 minutes or more digging around in the bottom of my drawer and that make-up bag trying to just find a couple of bobby pins. I know all you ladies out there feel me on that one! I also went through my make-up and set aside all of my eye make-up. I only occasionally wear eye make-up, so I didn't see any use in having my eyeshadow, eyeliners, and mascara in the utensil tray. They all went inside a smaller make-up bag that I tucked into one side of the drawer. And voila! 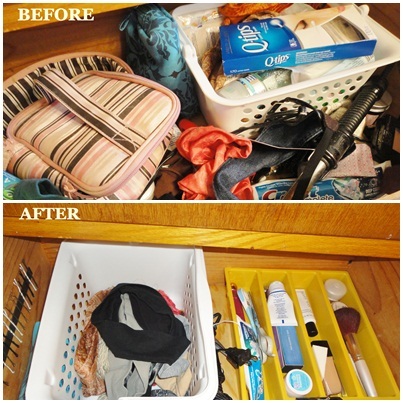 A clean, organized, and efficient bathroom drawer. Everything is visually available. There is no more digging. No more asking myself, "Hmmmmm... where is that?" All this organization for less than $2.50! Please feel free to send me your Pinterest organization pins to help me with this one! Both of those things are on my list of items to organize. Can't wait to see your next project. stop by at lavitaebella-elisabeth.blogspot.com and say hi when you get a chance! Carrie, these are great tips. I need to get my bathroom cabinets organized. Everything is just thrown in them with minimal organization. Thanks for sharing on Marvelous Mondays! Love it! I need you to come help me organize my house! Thanks for linking up with 2GAAP! Thanks so much for linking up with Amanda and me for Two Girls and a Pin http://britpins.blogspot.com/2012/08/two-girls-and-pin-diy-washer-bracelets.html (back in August). Her and I have both been going through so much and haven't had time to do much in the blog world. But I wanted to let you know, you've won a featured post on my website! My schedule is pretty open, so email me at pinterestaholic (at) gmail (dot) com with html for a post and I'll get it up ASAP. It can be anything you want (recipe, craft, introduce yourself...anything!) Congrats! !